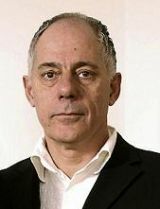 Bas Springer ( Amsterdam, 1952 ) is a pioneer and expert on world music for 26 years. Springer compiles the music for the Dutch Radio 5 program 'Dichtbij Nederland' ('Close to the Netherlands'). He also writes about world music for several Dutch magazines and is playing danceable world music at parties, festivals and concerts. His interests and knowledge ranges from Congolese soukous to Brazilian baile funk and from Ethiopian jazz to Cuban timba and Colombian cumbia.